Tropical interior design tops a cool new wave of design. It looks "hot" but it needs to feel cool! It often uses soothing blue colors - inspired no doubt by the ocean waves. "Here's a room I was in while visiting St Lucia. It had a cool and refreshing feel to it." Pittsburgh Paints has two perfect shades of blue for tropical interior design. "Ocean Breeze" and "Ocean Dream" are beautiful blues. Of course, a tropical theme is not always down in the "blues." This style draws from nature. Colors of nature can be either pale or strong tones. They represent the sand, sea, or sun. Or they can take on the bolder colors of flowers and foliage. Benjamin Moore's "Tropical Turquoise" is a deep shade. Its name may remind you of the ocean. Its color, however, is more in tune with foliage. Many shy away from bold colors. But a vibrant green could be your personality color! Color quizzes have progressed beyond childish fun! 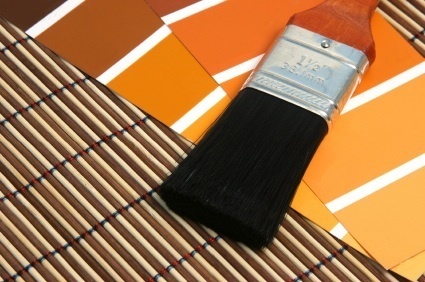 Pratt and Lambert Paints offers two choices. They provide interior and exterior quizzes. Pittsburgh Paints has the Color Sense Game. It helps you discover your colors. Some of the bolder tones may be just right for you! 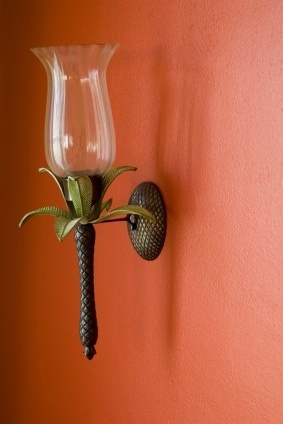 Carribean style often uses strong colors even over stucco wall surfaces. Stucco finishes can add extra depth to a design. Textured paint can also work well to hide imperfections. Behr has a Ceiling Popcorn Texture Paint. It comes, however, with mixed reviews. Some customers found it difficult to apply to their surfaces. Others decided to thin it with ordinary white paint. The consensus was that it worked well after that extra step. 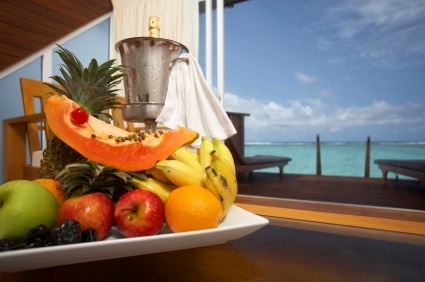 Many features can contribute to a tropical theme. One of the most overlooked, however, is lighting. Lighting is often the last decision made in a decorating project. It should be your first consideration! Your lighting affects the color throughout the room. Turning on the lights to your room can give you a different view on how the colors will appear. Your colors will have a Bluish tint when using Fluorescent lighting. A Yellow hue can appear if your lights are Incandescent. And Halogens lights often have an almost White illumination. It's important to take this into account when choosing colors. There is exquisite lighting on the market to fit an exotic theme. A knotted rattan high wall sconce can add a natural shine. Pineapple glass sconces can bring some Hawaiian light into your room. There is even a lighting collection based on the beauty of the Fiji Islands. Tropical interior design is just an overall bright and cheerful style. So, let's ride the wave of color and design together! Room Color Schemes is always the first to test the waters!